Ecumenical Advocacy Days 2018 - a weekend of faith-rooted worship, learning and advocacy in our Nation's capital - will focus on the uprootedness of our world. We will analyze current policy and envision ways to more fully and justly respond to the global and local needs of displaced communities. Together we will seek policy changes that advance hope and overcome the devastating impacts of conflict, climate change and corruption on God’s people. UCC PRE-EVENT - Join us on Friday, April 20th in Washington, DC as we hear from pastors, lay leaders and immigrants responding to the needs in their communities. Hear best practices and meet UCC colleagues who can support you and your congregation as we strive to live out our call to be an immigrant welcoming denomination. Learn more and RSVP. Join us in Washington DC as we gather together and take our message to Capitol Hill! Special opportunities to meet and network with UCC and DOC members and leaders will be available. Don't miss this opportunity! 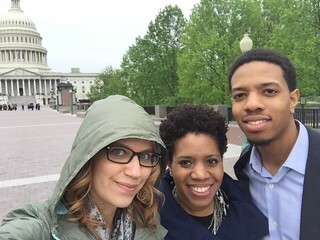 Emily McKenna, a young adult leader from the UCC Connecticut Conference, describes her time at Ecumenical Advocacy Days as "truly life changing." Read more about Emily's experience in this post - "4 Days of Advocacy: Learning, Networking, and Lobbying." Doubletree by Hilton, Crystal City – Washington, D.C.